Despite being dead for a quarter of a century, Colombia continues to fight against drug lord Pablo Escobar's legacy. But this time it is not about narcotics, but about the protection of an ecosystem from the threat of wild hippos. The large mammals that inhabit sub-Saharan Africa were illegally smuggled into Colombia by Escobar and kept at his vast ranch, the Hacienda Napoles. Elephants, giraffes, rhinoceroses also populated the majestic farm as if it were Escobar’s personal Noah’s Ark. But after his fall, the Colombian State expropriated the hacienda and moved its exotic residents to zoos in the cities of Medellín and Bogotá. Everything, that is, except for the hippos. 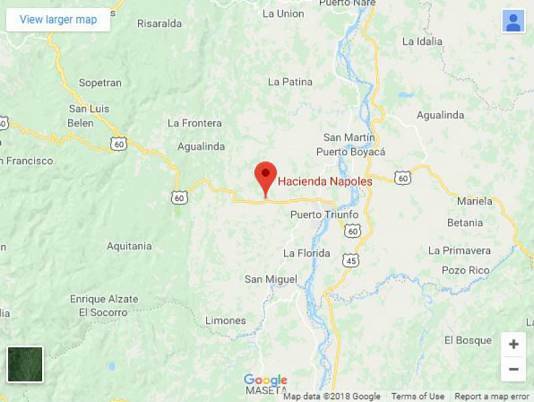 "There were four of them," says David Echeverri López, a biologist at the Regional Autonomous Corporation of the Black and Nare River Basins (CORNARE), a region affected by the invasion of hippos. Now, there are more than 40. They crossed the gates of the Hacienda Napoles to freedom in the Magdalena River, where the population is increasing uncontrollably. Unlike Africa, in Colombia they do not have natural predators. "They are in a quiet area where they are reproducing," says Echeverri. He explains: "It is an invasive species that is causing problems for native systems." Their large mass — they weigh from 1 to 3 tons — and their territorial behavior makes them a threat to the river population, especially for fishermen. The WHO has classed the hippopotamus as one of the most aggressive animals in the world and the deadliest in Africa for humans, with an average of 50 deaths per year. "We have not had confirmed attacks. We have heard rumors, but there is no evidence," says Echeverri, adding: "We have been fighting hippos for several years. They are very unpredictable." One of the biologist’s tasks is to count the animals and conduct a census. "They have persecuted me in my follow-up work ... when they feel they are being followed, they attack," says Echeverri. The animals are monitored by security cameras. It is estimated that there are 33 of them in the lake and indications of about six or seven more outside. 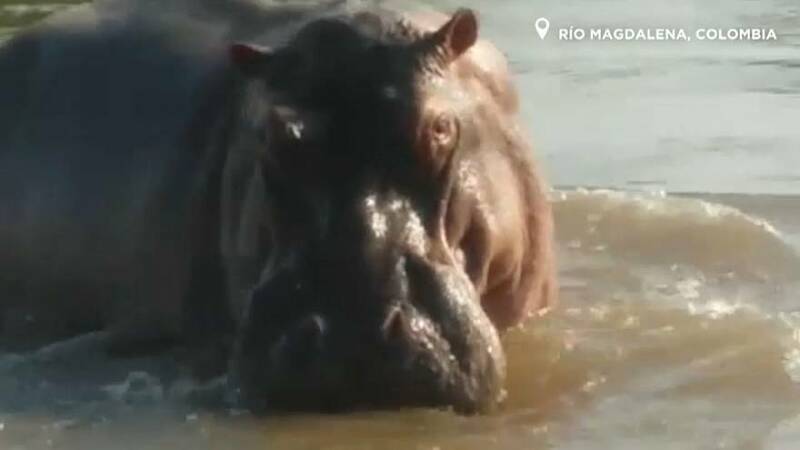 In 2017, one of the hippos soared to fame on social media after it left its habitat and wandered through the streets of Puerto Triunfo town. Despite its fiery temper, the hippo is still a popular animal, according to Echeverri: "People love the hippopotamus, they see it as very striking. It's a very curious subject. They (the media) call us from all over the world with great interest." Echeverri, however, does not dismiss that they are a serious problem for local people: "[The hippos] eat grass meant for the cows; in the rivers they become a risk, tourist services are affected ..."
He adds: "We wanted to raise the possibility of sterilising them, but it is very expensive. We did it with one individual and it cost us 100 million pesos (€28,227). “We have spoken to African experts because we are considering the possibility of releasing them in that continent, but they say it is risky because they can carry parasites from our environment, which could be a problem for the African environment." In addition, they do not have the necessary budget for their conservation, and prefer to allocate what they do have to native species such as felines or bears. So the the question remains: What zoo will give shelter to the feral hippos of Pablo Escobar?